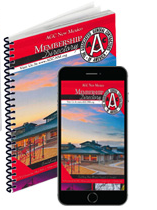 in AGC New Mexico's print and online options! contact Kelly Roepke-Orth, (505) 842-1462. Loyal readers include AGC members, NM state legislators, and other leaders and decision-makers in the NM construction profession and business community. Regular features include a message from the AGC Board President, Member editorials on relevant industry topics, and key updates from our departments of Workforce Development, Safety/Regulatory and Public Policy. To receive a free subscription or submit a Member editorial, please contact us here or call us at (505) 842-1462. ** Member news and guest editorials are always welcome.